Jordi Camps is Chief Curator of the Medieval Department of the Museu Nacional d’Art de Catalunya (MNAC) in Barcelona, where he has curated a number of exhibitions. He is one of the principal scientific coordinators of the Enciclopedia del Románico en Cataluña and is a member of the project Magistri Cataloniae. His personal research interests revolve around sculpture between the 11th and 13th centuries, and the history and historiography of the Romanesque collections at MNAC. Manuel Castiñeiras is Associate Professor of Medieval Art History at the Universitat Autònoma de Barcelona (UAB), where he acted as the Head of the Department of Art and Musicology from 2014–17. 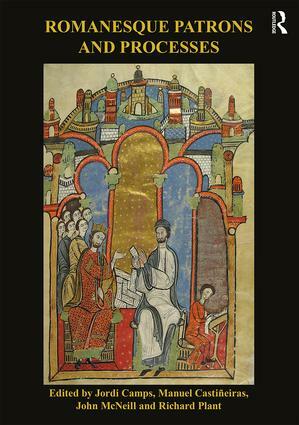 His research focusses on Romanesque art and medieval panel painting, though he has also worked widely on pilgrimage and the question of artistic exchange in the Mediterranean. He is currently the 2017–18 Samuel H. Kress Senior Fellow at the Center for Advanced Study in the Visual Arts-National Gallery of Art, in Washington DC. John McNeill teaches at Oxford University’s Department of Continuing Education and is Honorary Secretary of the British Archaeological Association, for whom he has edited and contributed to volumes on Anjou, King’s Lynn and the Fens, the medieval cloister and English medieval chantries. He was instrumental in establishing the BAA’s International Romanesque conference series and has a particular interest in the design of medieval monastic precincts. Richard Plant has taught at a number of institutions and worked for many years at Christie’s Education in London, where he was Deputy Academic Director. His research interests lie in the buildings of the Anglo-Norman realm and the Holy Roman Empire, in particular architectural iconography. He is Publicity Officer for the British Archaeological Association and co-edited the first volume in this series, Romanesque and the Past.